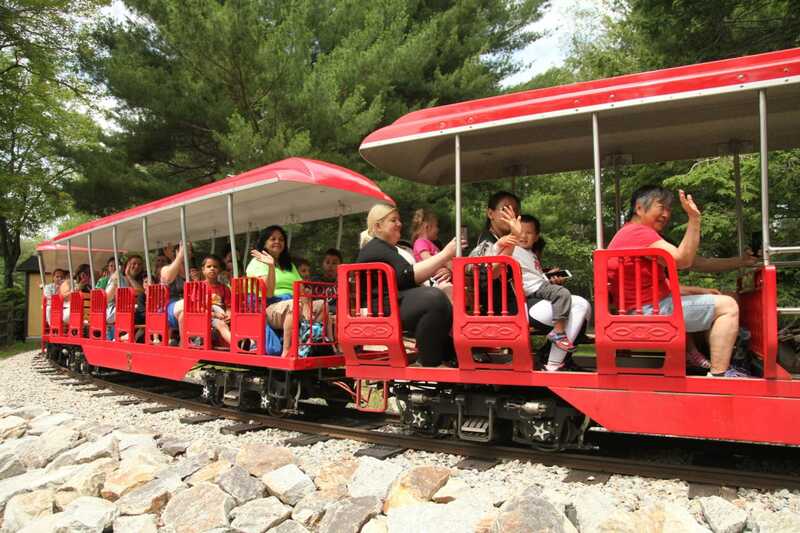 For decades, the Explorer Express Train has provided excitement for EcoTarium visitors. 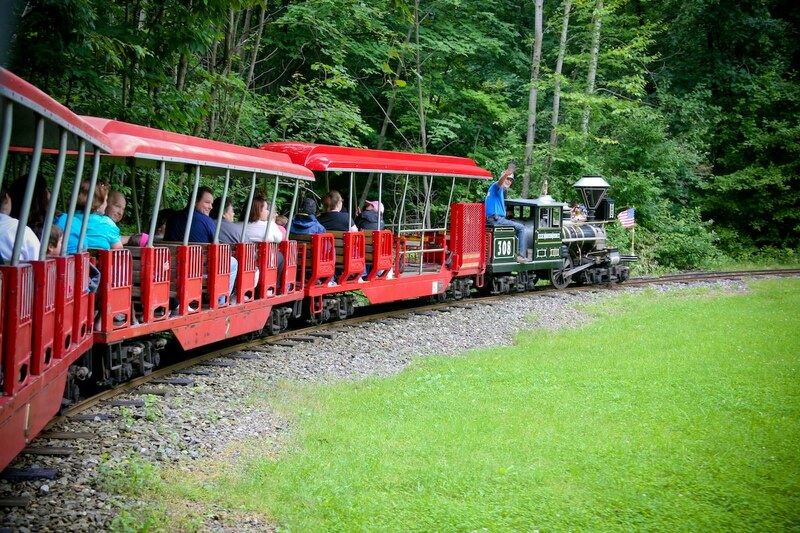 Open-air passenger cars take visitors on a scenic 12-minute ride; a relaxing and beautiful way to see the museum grounds. 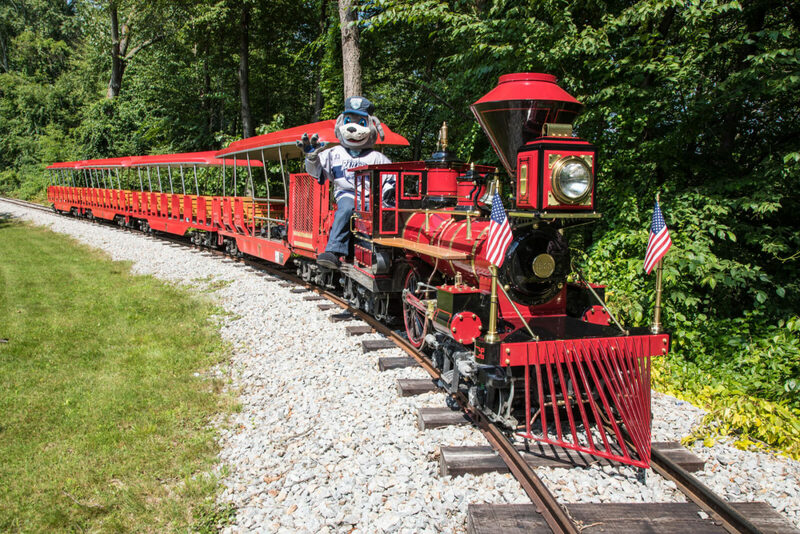 As part of a recent partnership with the Worcester Railers Hockey Club, the EcoTarium was able to purchase a new train engine, number 395, which is a replica of the 1863 C.P. Huntington steam locomotive. The train station has been “Railerized,” in the blue and gray colors of the hockey club. Train engineers are outfitted in apparel with the Railers logo. Train tickets are sold and seats are filled first come, first served for each departure. Each run is capped at 45 riders. *The train is weather dependent: if the temperature drops below freezing, the train will not operate. Weather delays in operation can be caused by low temperature, lightning, high winds or other related factors. Tickets are available at the train station on the day of your visit and are stamped for a scheduled time (see below). Tuesday through Saturday: 10:30 a.m., 11:00 a.m., 11:30 a.m., 12:00 p.m., 12:30 p.m., –BREAK– 1:45 p.m., 2:15 p.m., 2:45 p.m., 3:15 p.m., 3:45 p.m., 4:15 p.m.
Sunday: 12:45 p.m. 1:15 p.m., 1:45 p.m., 2:15 p.m., 2:45 p.m., 3:15 p.m., 3:45 p.m., 4:15 p.m.
We can secure WC-19 wheelchairs, but passengers must use EcoTarium occupant belts, we cannot except WC-18 belts. We recommend that riders needing accessible boarding arrive 15 minutes before their scheduled ride time to allow ample time for our train engineers to assist passengers with boarding. Based on the size and attachments points in our accessible coach we cannot safely secure three-wheeled mobility vehicles at this time. Three-wheeled mobility devices may be stored in the stroller parking area and the passenger may ride in a standard bench seat if able. Because of engineering restrictions on the train car itself and loading restrictions we cannot accommodate passengers over 430 lbs.